JAM is the brain child of John Sudhakar, a multi-faceted musician in Chennai with twenty years of experience in music education. He started learning music under Late Padmashri Handel Manuel. Over the years he has become an accomplished composer, arranger, conductor, and teacher. His compositions include corporate anthems, spiritual melodies and children’s songs. Do you love western music? Yes, of-course, everybody does and this is the reason why you are here in this niche. Well, let’s briefly look into – history of western music, its impact on music lovers and tips to choose western music classes. As the term "Western" represents the music related to western people or the western culture. Western music is drawn with strong influence from English & Scottish music. It revolves around country music and cowboy singing. Secondly, western music connects with people of the western US & western Canada geographically. For many people, especially youngsters, learning western music is NOT just a hobby but it is their passion. And to assist those western music lovers, some music schools offer music classes. Through these western music classes, one can get huge exposure to music theory, voice training and instrumental knowledge. Thus recent generation youngsters are blessed to explore more on the world of western music. o Some music institutions teach Indian music (Hindustani / Carnatic), which is also classical music. But in general, music schools use the term western music or western classical music to differentiate themselves from others offering Indian music education. Thus be specific in the type of music that you wish to learn and choose the music academy accordingly. o Preferably, the music school should have faculty with expertise in coaching music of International standards. Thus by selecting this type of music institution, you can reach good heights in music education. o Not only the faculty but also the musical environment should be motivating to learn western music. The students should be musically oriented so that they grow their talent in music. You can show success in the musical path when the surroundings are filled with positive vibes. o Good coaching in courses like keyboard, vocal training and singing is usually offered by limited western music schools. o The music institute must follow theoretical coaching method along with practical classes to make the music learning exciting. Just theory classes alone may make it boring. Thus music theory classes and practical training method must go hand in hand. o Will anyone prefer the music schools which don’t offer a certificate in music learning? And so be very specific while selecting the institute for music learning. Double check about their certification programs before joining their institute. JAM provides a holistic approach to classes they offer in western music. Youngsters who join Johns Academy can feel the joy of music as they get trained by a professional music educator. 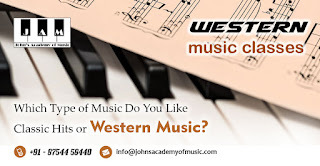 John’s Academy of Music offers studio learning sessions and other unique opportunities through which you can gain a lot of musical exposure. Finally, to wrap things together, JAM has excellent teachers, good facility and the vision for quality music education. Like To Have Fun While Learning Keyboard?